Mold is found where there is a moisture problem. High humidity, plumbing leaks and roof leaks can all contribute to mold problems. Dryers not preperly vented and moisture in basements and crawlspaces that is not dealt with will also become larger problems. 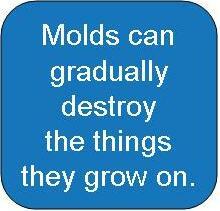 Mold typically flourishes in moist, dark areas. It can grow in bathrooms, basements, attics and even inside the catch trays of refrigerators and air conditioners. Mold can irritate individuals with seasonal allergies and other respiratory conditions, and act as a potential trigger for asthma attacks. If I find mold should I have it tested? Probably not, mold testing is not usually recommended. Testing is expensive and provides very little useful information. If you can see mold or smell mold, there's mold. All molds should be treated the same in terms of cleaning and removal and the time, money and energy devoted to testing are better spent removing the mold. Even if testing is done, there are no standards to determine if the types of mold or the concentration, will cause an adverse reaction. Use a hygrometer to monitor the relative humidity level in your home. Typically, it's recommended that it should be between 35 and 55%. Dehumidifiers can be used to lower humidity levels that are above this range. If you have flood or other water damage, take care of it before mold has a chance to grow.